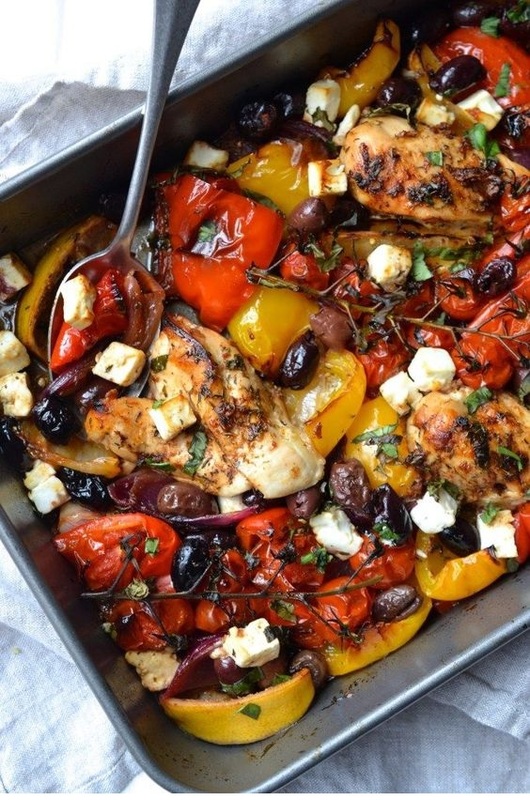 A super easy traybake packed with roasted peppers, tomatoes, olives, red onion and chicken. It takes just 30 minutes to make! In a large baking sheet or roasting tray, add the chopped peppers, red onion slices, artichoke hearts, lemon wedges and tomatoes. In a bowl whisk together the garlic, olive oill, vinegar, paprika and thyme. Pour 1/3 of the sauce over the veggies, sprinkle with salt and pepper and toss until well coated. Place the chicken pieces on top of the veggies and brush sauce. Bake in the oven for 25 minutes.